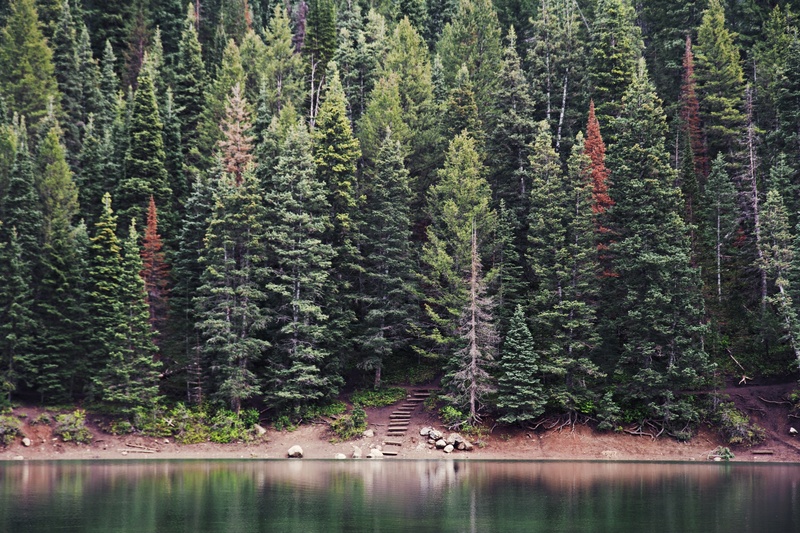 At Twenty Over Ten, we stress the importance and benefits of creating evergreen content. 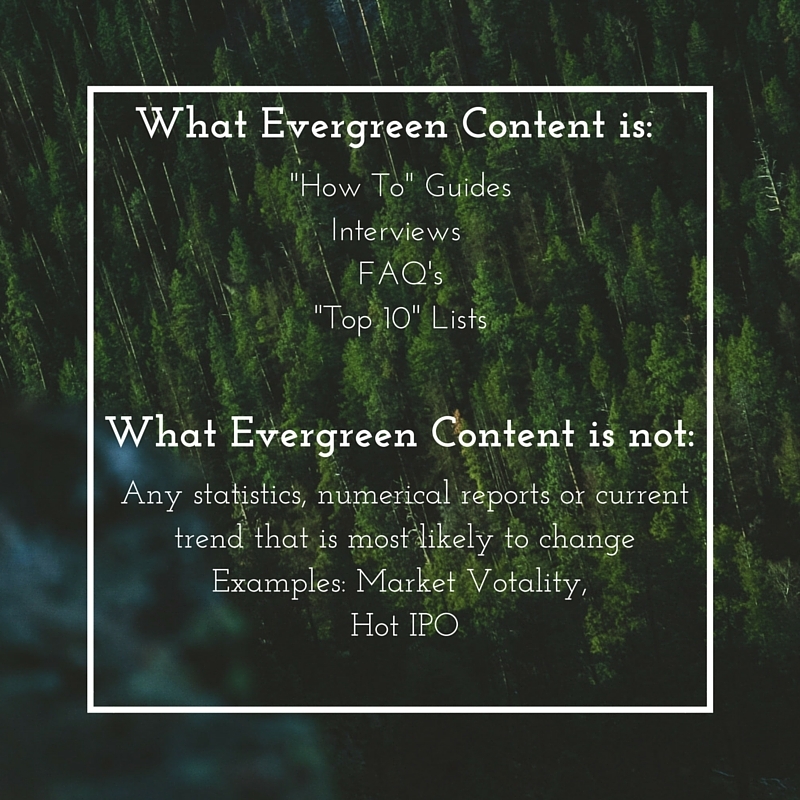 Today we’re going to explore the do’s and don’ts of evergreen content as well as its purpose and function, using content that would be on a financial advisor website as an example. Evergreen content is any blog or article that will remain relevant to your audience, as opposed to those topics that change over time. 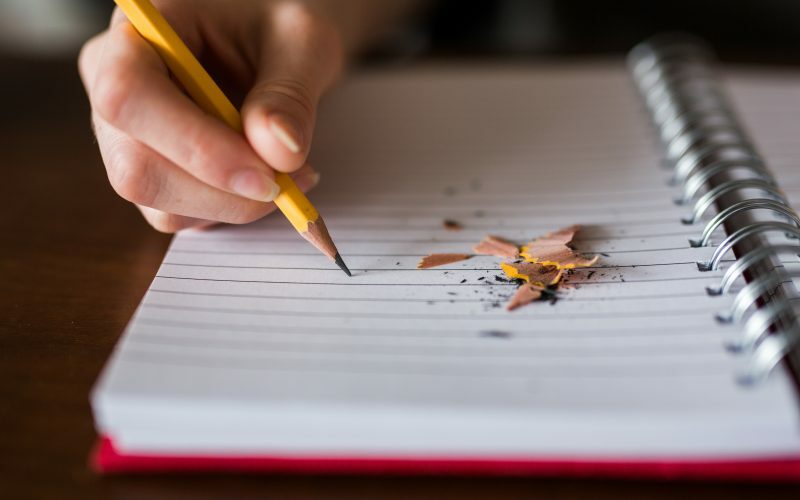 The word evergreen is most often used by editors to describe certain kinds of stories; stories that, because of their topic, are always of interest to readers. The idea behind the evergreen stories is that they’re stories and topics that are always fresh, and your audience will consistently be interested in searching for them or learning more. The purpose of adding evergreen content to your blog or website is to educate, entertain and convert new leads into clients. Since this type of content is generally more topic-focused and informative it never really expires. This allows your firm the opportunity to recycle information, which saves time, energy and money while still generating business and website traffic. For example, if you write a great post about how to talk to your significant other about finances, that article will be relevant for years. You can re-share it each year without ever having to update it. Additionally, the longer it is up on your blog, the greater chance someone has to search for that topic and land on your site. INSTRUCTIONS: Tutorials or “How to” guides are invaluable source of knowledge. INTERVIEWS: Interviews can be a a great form of evergreen content because they are everlasting and can easily be recycled. 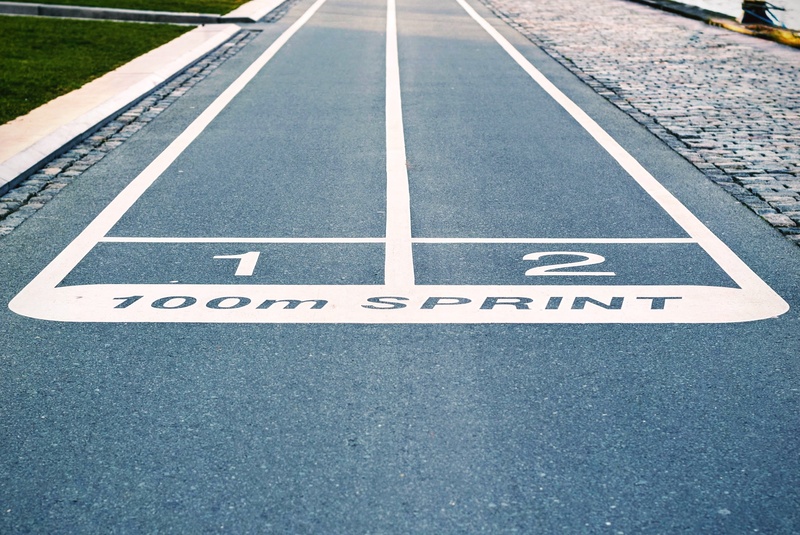 Examples of interviews can be with industry experts, influencers or even members of your team. FAQS: FAQ’s on general topics can be another great example of evergreen content because the answer to topical questions rarely change. For example – “What is an IRA?” Remember to clearly and concisely create term definitions so that every reader can comprehend the information. LISTS: Lists can vary from a compilation of examples, to industry resources and tools or “Top 10” lists. These types of content are very easy for readers to understand because they are concise and organized. 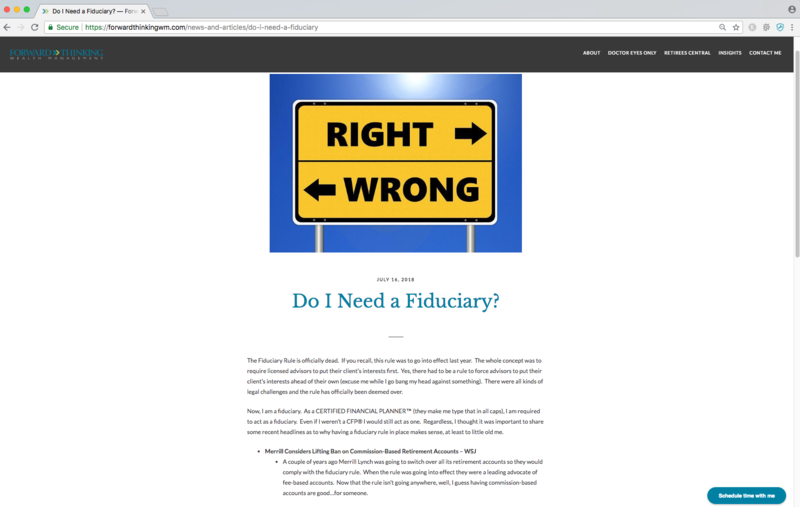 In the below example from Twenty Over Ten client, Forward Thinking Wealth Management, published a blog post on the topic of “Do I need a fiduciary?” The article covers basics on what a fiduciary is in the financial planning industry and why someone seeking financial advice should consider finding a fiduciary financial advisor. They also include examples of what a fiduciary is not and why they take the fiduciary responsibly seriously at their company. Another example of evergreen content comes from Twenty Over Ten user, WealthKeel. 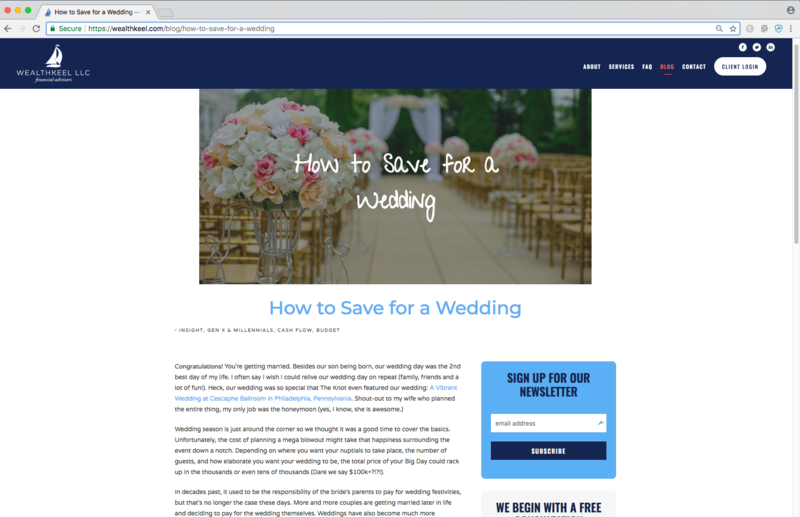 This how-to style blog post is a great example of evergreen content as they share tips on how to cut back on extras, create a wedding budget, and more. 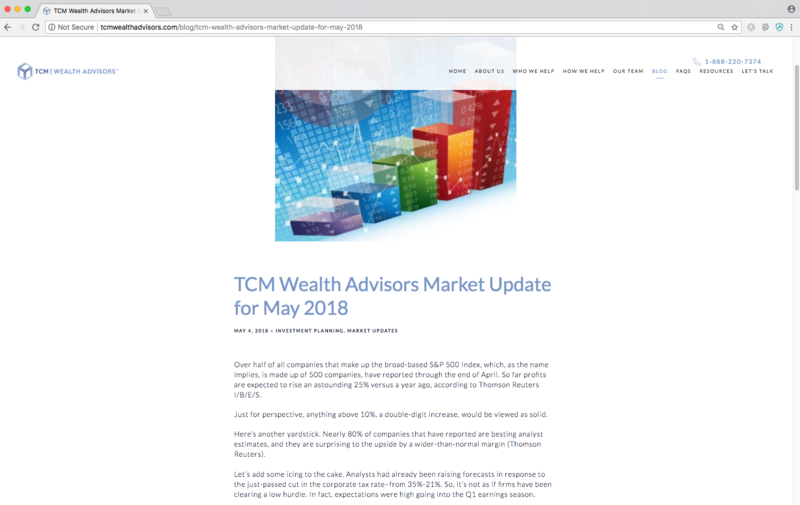 The example below from Twenty Over Ten user, Financial Planning Done Right, shares a non-evergreen blog post around tax season. 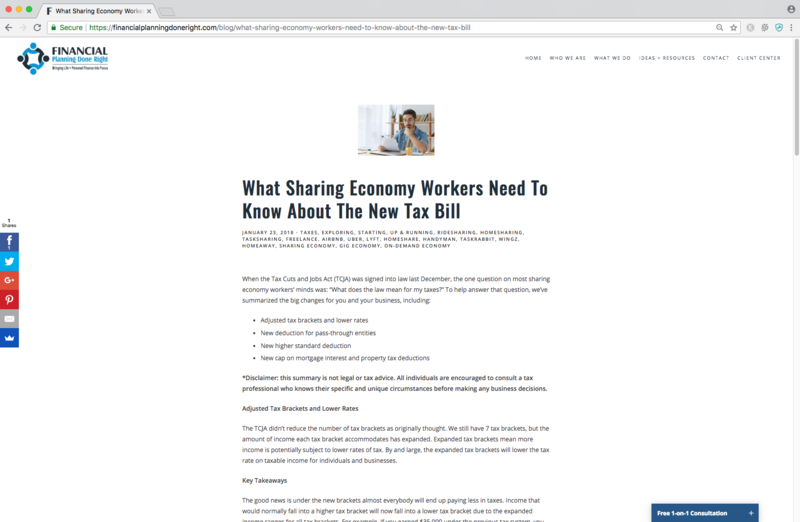 This particular post shares tips on what sharing economy workers need to know about the new tax bill in 2018. This content is specific to the tax bill for the year 2018, so it would be considered non-evergreen content because we can assume that in 2019 there will be a new tax bill with different stipulations that sharing economy workers will need to consider. 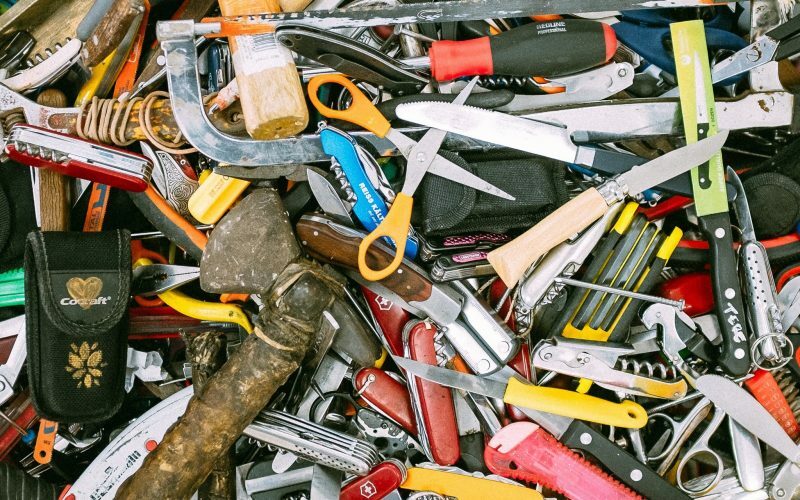 Nevertheless, it is still a really well put together blog post that would be applicable for sharing economy workers in 2018!